In combination with the second forthcoming volume of Ion, I'll give an early prediction that the Ion: Guardian of the Universe series is actually pretty good. 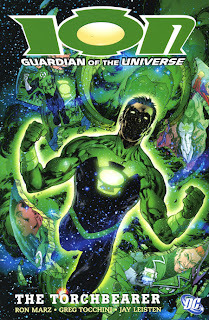 Marz's Kyle Rayner is a fantastically down-to-earth Green Lantern, making the cosmic elements of the story more approachable; Marz also writes great scenes between Kyle and Hal Jordan, and underlies the story with a spooky sense of conspiracy. I was concerned that Marz's Green Lantern might be an ill-fit with that of Geoff Johns and Dave Gibbons, but Ion fits right in. But by the time you get through the forgettable bounty hunters and the ghosts of Christmas past illusions, not much happens in these six issues. Kyle stays for the most part in one place (you'll understand after you read it), and the only really surprising part is a cameo by a mystery villain. Ion: The Torchbearer is decompression at it's worst, because it's decompression disguised as a foreward-moving plot, until you get to the end and find yourself basically back where you started. In conjunction with the other six issues of Ion, maybe this would have been all right. On its own, it feels like a fake-out. So cheers to Ion, even if it's boo to DC Comics. Green Lantern up next, and then the sky's the limit! I won't be buying this but if you read Absolute Sandman Vol. 2 I think it'd be safe to say that we'd have a new champion. Yeah, I'm hoping to start reading the Absolute Sandmans. Maybe around Christmas time, if Santa's nice to me!